The Tower of London is known for a lot of different things. First of all its role in the history of England, its ability to control London of course, but also the fact that it came to us in very good condition, in a feudal style typical of the castles of that period although much of the towers were rebuilt in the 19th century. But if the tower is also known for the acts of torture and the executions that took place there, the crows are one of the curiosities of this fortress. The London area is a natural habitat for crows. They are found in the north of France but also in the North. It is an animal that needs little heat and can live in a large number of territories as long as it has its food. The presence of crows in the tower may be due to the many corpses that passed there, mostly animals, of course, but also enemies of the king who were abandoned to be devoured. Unfortunately the growth of the British capital and the reduction of the country areas has made escape these animals. So there were fewer and fewer ravens in London. The legend of the Crows of the Tower of London goes back to the reign of King Charles II. It seems that the flight of the crows began to interfere with the work of the royal astronomer John Flamsteed, who made his daily observations with a telescope located in the White Tower Observatory. King Charles, who was fed up with bird droppings on the grounds around the Tower, initially ordered the crows to be killed, but he was not advised to carry out this order because "if the crows left the cave, Tower of London, the monarchy would fall. " Suddenly, by pragmatism, King Charles annulled his order for the extermination of the ravens. He had the Royal Observatory installed at Greenwich a few miles away, and ordered the wings of a few ravens to be cut to ensure they were kept at the Tower. 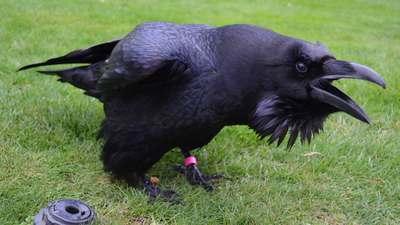 Over the centuries, captive crows have been associated with this legend which says that the monarchy will collapse the day the last crows will leave the tower. The crows population almost disappeared once in the history of the Tower of London. It was during the Second World War, a period during which only a raven lived. Of course the managers quickly managed to complete the group. At present, the group of crows held captive in the Tower contains seven individuals, these are common ravens. To identify them each raven is ringed with a different color. They all have a name, given by the guards, the Yeoman Warderr. Nowadays their wings are trimmed so that they do not go away. Their diet is made of fresh fruit, cheese and fresh meat such as beef, chicken or lamb. They also receive vitamins and other supplements, such as hatched eggs and cod liver oil. The crows are well cared for, as the thousands of tourists who spend their days in front of their cages can see. Moreover, these visitors are invited not to feed them. Also watch out, bite them if they feel threatened. ! 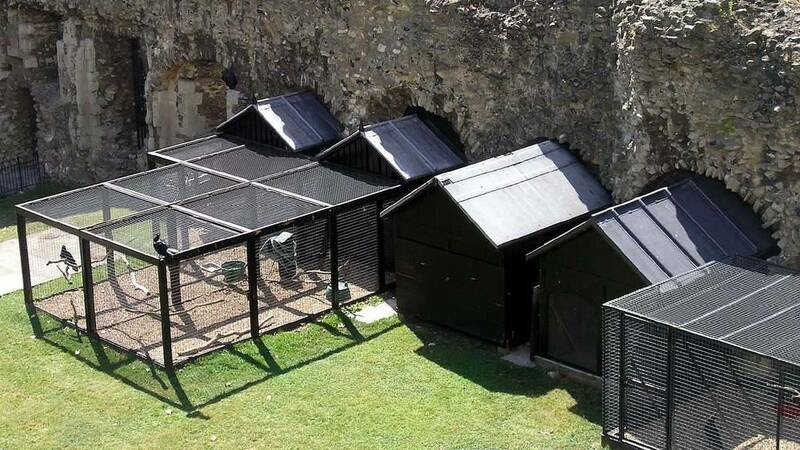 Captive crows in the Tower of London have a life span of more than 40 years, some of them. Depending on the periods their cages are moved, sometimes they are in the moat on the north side, sometimes in the inner courtyard, next to the white tower.